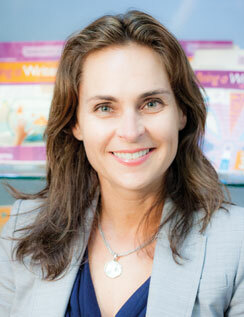 Kelly Stuart leads the dissemination efforts at Collaborative Classroom to bring literacy programs integrated with social skills development to over 15,000 new classrooms each year. Previously, Ms. Stuart was the senior research associate at WestEd. She led dissemination for the Doing What Works (DWW) website, which developed practical tools and videos to support educators in their understanding and use of proven research-based practices. While at WestEd, Ms. Stuart launched the U.S. Department of Education’s School Turnaround Learning Community (STLC), an online community for states, districts, and schools involved in turnaround efforts. Prior to WestEd, she was the director of special programs at the Success for All Foundation. Since beginning her career as an elementary school teacher, Ms. Stuart has worked with educators in schools and after-school sites in every state. Ms. Stuart has received a BS in liberal arts, a teaching credential, an MA in education administration, and an EdD in education leadership.